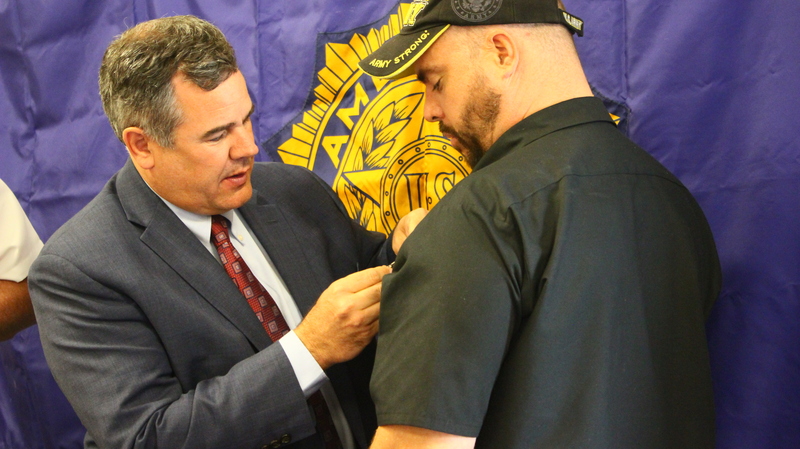 ST. GEORGE — Joe Hamblin, aka “Extraordinary Joe,” received the Medal of Valor Wednesday evening at the American Legion Post 90. 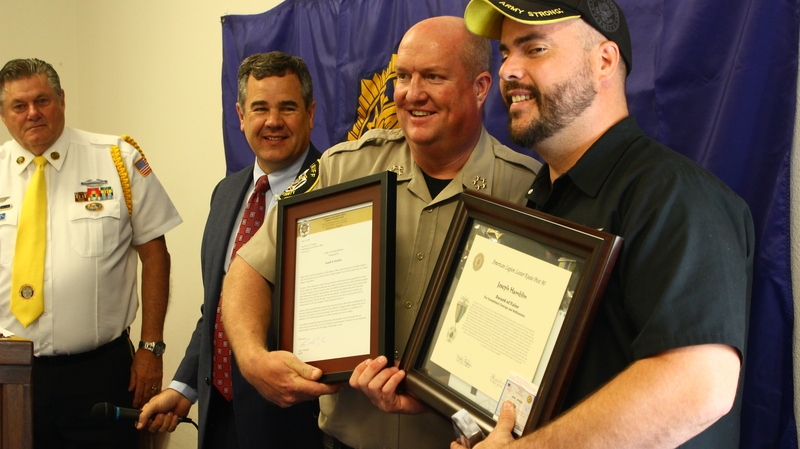 Hamblin is a veteran who risked his life — despite an injured foot — to assist a stricken woman in an out-of-control vehicle. In addition to the Medal of Valor, Hamblin received numerous other commendations from the City of St. George, Washington County and the state of Utah. On March 31, Hamblin was driving his pickup truck on Bluff Street when he noticed an out-of-control vehicle. He realized the female driver was slumped over unconscious. Despite recent foot surgery, Hamblin sprang into action, jumping onto the moving vehicle and guiding it to safety at great risk to himself. At Wednesday’s ceremony, numerous awards were given out, the majority of which went to members of the American Legion. The Citizen of the Year Award was given to Jerry Olson, administrator of the Southern Utah Veterans Home. Olson won the award for his dedication to caring for veterans. However, the evening was primarily about honoring Hamblin for his actions. 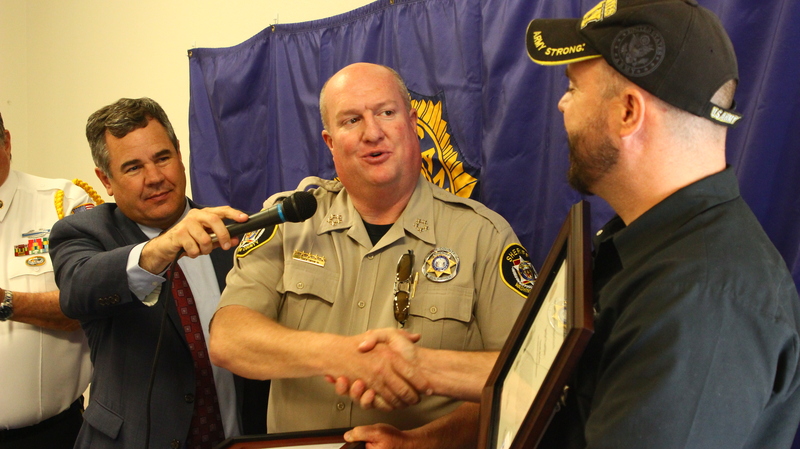 In addition to receiving the valor medal, he was also given recognition from the City of St. George, the Washington County Sheriff’s Office, the Washington County Commission and the Utah House of Representatives. Mayor Pike said there are many times when people come across a situation where someone needs help. Rep. Jon Stanard was also in attendance representing the Utah House of Representatives. “(It’s) just awe inspiring to hear about what you were able to do in quick thought and actions,” Stanard said to Hamblin. Stanard then read a proclamation from the House of Representatives praising Hamblin’s actions. The Medal of Valor is given to anyone within the community who commits a heroic act, American Legion Adjutant Ski Ingram said. Hamblin was given free admission to the American Legion. During his acceptance speech, Hamblin thanked the St. George Police officers who were present during the crisis, the medical personnel who took over the care of the driver and the two women who had quickly made the 911 calls. He also thanked his family, the St. George Police Department for their daily sacrifices, Mayor Pike and St. George News for the article and video of the incident. His poem brought tears to the eyes of many of those in attendance. Hamblin’s mother, Violet Unruh, said she was very proud of her son but not surprised at his actions. It’s been very very humbling, and its made this vet find a better purpose in life, a motivation and a wanting to serve this community and … spread the message to others out there who come across a crisis situation to not be scared, not to throw your cameras out and film it, but jump in and help, especially the officers and those who need your help.